We tend to get excited over the shiny new boxes Apple makes. Shiny new iPhones, shiny new MacBooks and oh-so-shiny iPads. But something else Apple just brought out could have a much greater effect on us all longer-term: Apple ResearchKit. It's a platform designed to help out with medical research, and not one that requires any extra hardware, or hard-to-understand software. It'll use iPhones, iPhone apps and a similar cloud data network we all use today. "We're incredibly confident that ResearchKit is going to transform medical research," said Apple CEO Tim Cook. But how is it going to work, and why could it be so important? There has been a lot of talk recently about how smartwatches might be used to improve healthcare. And talk of things like glucose monitoring in contact lenses (a Google Project) brings to mind quite a gadgety angle. However, the basic aim of ResearchKit is more pragmatic. It's about data. ResearchKit is a a platform into which apps feed into, and it will be used to collect and collate reams of data. This data might be inputted manually or automatically, depending on the app used. And where relevant, the data can be collated and used in wider research. Importantly, though, it won't be Apple doing this. Apple won't have any access to your data, if you're worried that ResearchKit is just an alarmingly creepy way to mine your personal information. Which conditions could it help with? ResearchKit is a framework designed to enable other people's ideas. As such, it's pretty much completely agnostic about the conditions it can help with. To prove its worth, though, Apple came out swinging with five apps designed to help with the research of five major conditions. These are asthma, diabetes, Parkinson's, breast cancer and heart conditions. We've seen the sorts of ways it can help with Parkinson's in particular. The app incorporates a few basic tests designed to help monitor the disease and its current state of development. They are designed to roughly replicate the sorts of tests a GP might administer, using software and the sensors on an iPhone in place of a decade or so's medical training/experience. And y'know, a doctor's eyes, ears and the rest. You hold the phone while walking 20 paces back and forwards, and the gyroscope/accelerometer monitor your gait. Parkinson's causes a patient to walk in a stuttery tremor-y fashion because of the way it affects the central nervous system. Then there's the vocal test. You say "Ahhh" into the microphone for as long as you can and the app monitors tremors in your voice caused by the disorder. These sorts of tests can be applied to all sorts of conditions, with the five talked about so far just being the starting point. Apple was keen to demonstrate its legitimacy by talking about the research institutions it has worked with on ResearchKit and the initial roster of apps. The Univeristy of Rochester and Xuanwu Hospital in China worked on the Parkinson's side of ResearchKit, while other partners include UCLA, Dana-Farber Cancer Institute, Massachusetts General Hospital, Mt. Sinai Hospital, Stanford University and Oxford University. There's really no limit to who can work on ResearchKit apps, though. It's not a series of medical technologies, but a platform through which the data from medical-themed apps can be brought together. 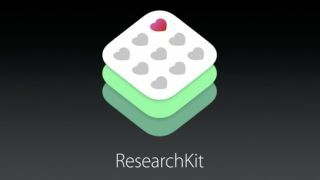 Current page: What is ResearchKit?